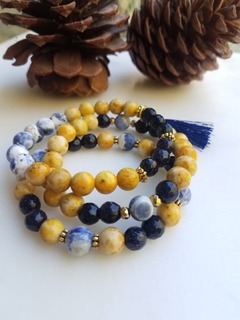 A trio of matte sodalite, jasper and blue goldstone + delicate coordinating tassel charm. A scrumptious golden delicious apple color with blueberry. Listing is for 3 piece stack as pictured. One size fits most 7-7.25" (can be resized at no additional charge prior to shipping. Please specify with order. 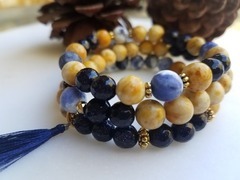 Blue Goldstone has a positive attitude; it is an uplifting stone. Promotes vitality. In physical healing it has the same attributes as copper helping soothe conditions of the joints and reducing stomach complaints stemming from anxiety. Blue is always associated with the throat chakra. The Sodalite crystal is the bold and heady catalyst to get you back in touch with your sixth sense, a vital part of our survival as a species. In today’s world, trusting your instincts helps open the doors to universal truths and the Sodalite gives you the strength and energy boost you need to teleport to a higher consciousness. 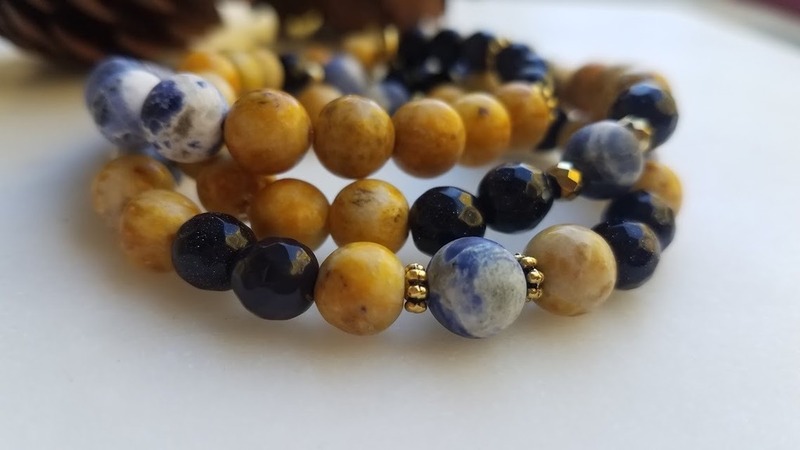 Bring the rich, royal blue color of the Sodalite crystal into your healing sanctuary and get ready to rock at the highest vibrations after a crystal cleanse that awakens the soul.